Tell us a bit about the company – how long have you been providing a removals service to France? Cranbury Removals is a family run business, based near Winchester, UK providing local, national and international removals and storage services. We specialise in removals to and from France. Tim Davies started Cranburys in 2001 when he bought a lorry and started carrying out domestic removals for local customers. The number of vehicles steadily increased and a furniture storage facility was set up. Tim carried out the first removal to France for Cranburys in the 2003. Since then, Tim has pushed the removals to and from France into becoming one of the most frequently used services that Cranburys offer. We have recently had a purpose built warehouse erected at our new premises near Winchester, which has given us space to house more storage containers, offer vehicle storage and most importanlty, operate even more effeciently in the larger offices. What are the most common areas of France you work in? 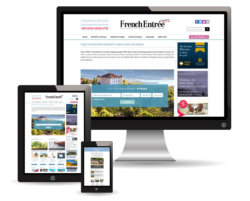 The majority of our work is carried out on the left hand side of France, which includes Normandy, Loire Valley, Poitou-Charente, Limousin, Aquitaine, Midi-Pyrénées and Languedoc-Roussillon. We have moved many customers to the Dordogne area of France and with such beautiful scenery and plenty of good wine, we can understand why this is favoured. How often do you make trips to France? Over the last two years, work over in France has considerably progressed for us. We carry out removals to and from France if not every week, every other week. We usually had busy spells at the beginning of the year and during the summer period but now it is throughout the entire year. What are the most enjoyable aspects of working in France? Many aspects of working in France are enjoyable and some obvious, such as the scenery, relaxed way of life etc. The main one for us has to be the traffic, or lack of! French roads are much quieter than UK roads, which means it is easier and quicker to travel. The ‘relais routier’ (truck stops) in France offer cleanlier services for HGV drivers than in the UK and are good value for money – most truck stops are free to park in overnight too. Any areas you particularly enjoy driving through and to? There is fantastic scenery in most places we drive to in France. A favourite has to be Alps with its windy roads. Others particularly enjoy driving through the Dordogne. The rolling hills and vineyards make for fantastic views. Tell us about your team on a typical French move, including who you are. We have two main drivers that alternate the French moves. Danny and Jack who are in fact brothers – it really is a family run business. Danny is 24 years old and Jack, 22. Danny obtained his HGV license in 2011 and Jack in 2013. They have gained an enormous amount of experience whilst driving over in France and are both very confident with it now. With that, we have certain members of staff that join Danny or Jack. Typically, we will send two men over to France at one time and if the collection/delivery requires more staff, we have a number of companies that we work closely with and will request assistance from. Not one removal, or customer is the same as the last, whether that be because of the requirements or the destination. There is diversity in what we do and that keeps the job interesting. When we are working over in France, we have arrangements to arrive with customers on certain dates or catch ferry crossings at a certain time/date and as long as we meet those dates, it is up to us which roads we travel. That’s a great opportunity to explore France! What are the customer service aims of Cranburys, or unique elements you bring? We aim for 100% customer satisfaction with every move we do, however large or small. We go above and beyond to create a unique experience for our customers. By unique, we mean that our services and quotes will be tailored to suit, whatever the customer’s requirements. Being a family run business, I think we have an edge that not many other removals businesses have. We have built a solid reputation thanks to our commitment to offering a personal service, with attention to our customer satisfaction, from your initial enquiry to completing your removal. Do you travel to France on certain days of the week? In a usual running of things, we would collect our customer’s belongings on a Thursday or Friday, bring the vehicle back to be stored in our warehouse over the weekend and, depending on the area we have to travel to, leave the UK on a Sunday evening or Monday morning. As you may know, heavy goods vehicles are restricted from using French roads on every Sunday of the year from midnight to 10pm so we have to work around this, as well as the public holiday restrictions throughout the year. What factors are involved in the preparation of a quote for the customer? In order to quote correctly, we try to obtain as much information from the customer as possible. If a customer is moving from the UK, we would usually arrange a visit by our estimator in order to see exactly how much there is to be moved and discuss the customer’s specific requirements, such as: packing or dismantling services, collection and delivery dates or storage requirements. With customers over in France, moving internally or back to the UK, the process of obtaining information can be a little more complex. Our first option would be to see if we have a member of staff that’s able to visit the customer, to carry out a survey, whilst already working over in France. If this is not achievable, we would need to gather information from the customer to get an idea of the total volume of the load. This could go as far as the customer providing a full list of their household items, which is preferred because we are then able to see exactly what items that customer has and include the correct materials in our quote and ensure the correct equipment is used if we carry out the move. We do also offer an online self-survey through our website. Customers can browse through the survey to select items within their home and submit the information directly onto our office system. How does the preparation for the moving day begin from your perspective? Preparation for the moving day begins from the moment the customer accepts our quote and books their removal date with us. It it from there that we would make ferry bookings, arrange our staff, order in or make ready the correct materials and equipment and ensure that we have explained the removal process to our customer and answered any relevant questions. What size job do you typically do – number of bedrooms? From 5+ bedroom houses to single items, we will move anything!. 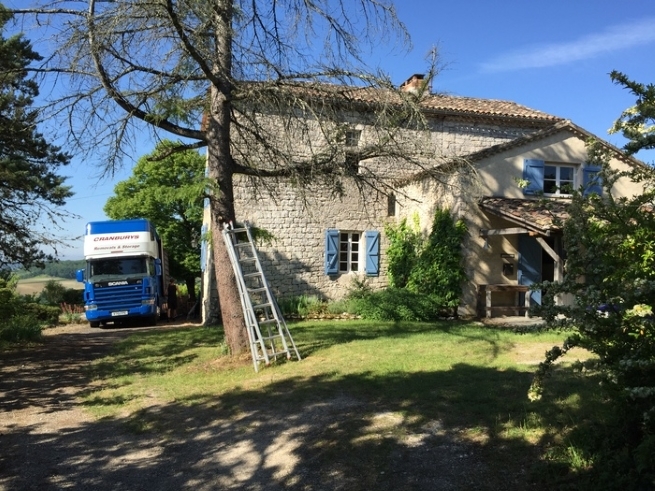 Many of the moves we have carried out to the Dordogne, or even the surrounding areas, have been full house removals of anywhere from 2 to 5 bedroom properties. These areas are where many customers relocate to for retirement or a change in lifestyle, consequently moving their entire home from the UK. There are also those customers that relocate for business and head to the cities within France – these tend to be smaller moves of 1-2 bedroom properties. Many of our customers still contact us today to arrange part load deliveries of animal feed, tools or household effects and say it can be cheaper than buying in France. There is no move to big or small for us. Do you have different vehicles for different job sizes? We do have different sized vehicles for different moves but we tend to carry out moves to and from France in our larger vehicles – 40ft Scania’s. Using the larger vehicles means that we are able to combine loads which effectively makes the move more cost effective, not only to us, but for our customers too. Sharing the vehicle means sharing costs. However, some customers prefer to keep their move as a ‘single load’ so they will have sole use of a vehicle, which is offered in a range of sizes. I guess an early start is essential? Early starts are not always essential but that completely depends on the customer’s situation. If our customer is selling their home and we are collecting the items on their completion date, our staff would arrive between 830-9am and would have the items loaded by midday-1pm. It is not often that our staff are required to collect a customer’s belongings and travel to France that same day, however it is something that we can do and have done in the past. How do you approach the work on the day pick-up? Is speed or being careful more important? Being careful is more important that being quick in removals. If we feel our staff are not able to carry out a move within a certain time-frame, we would look for way around this i.e a pack or part load service the day prior to collection or more staff being allocated to carry out the removal. What measures do you take to protect valuable or delicate items? Protecting valuable and delicate items is essential when having to travel long distances. In some cases, we have wooden crates made to measure for items such as chandeliers, fragile mirrors or pictures. These particular items can be protected just as well by using export wrap (4-ply paper blankets), export bubble wrap and heavy duty boxes. On every move, we use purpose made material or paper covers for items such as settees, fridge/freezers, TVs, mattresses and pianos. You must be used to the ferry by now – do you use a particular port? Because we are based just outside of Southampton our main route over to France is with Brittany Ferries, travelling from Portsmouth to Ouistreham (Caen). As mentioned, the majority of our work is carried out down the left hand side of France so docking in Ouistreham is the quickest route for our crew. The crew are provided with a cabin to rest/shower and a voucher for discount towards food and drink on-board. The steak and chips go down very well! Access must sometimes be a problem with narrow French country roads or busy street in towns. How do you deal with this if you have a huge lorry? A lot of people think that access would be a problem over in France, which occasionally it is, but the large country houses and barns are quite accommodating to our larger vehicles. Planning ahead and checking the access to properties using Google Earth and images provided by our customers is extremely useful. If the access at a property looks like it could cause a problem, we will hire a smaller HGV from a local Hertz or Europcar in order to tranship the items. This does involve extra work for our crew, having to offload from our large vehicle onto the hire vehicle and then again into the customer’s home but it is a situation that sometimes cannot be avoided. We once sent a crew to Saint-Vincent-de-Cosse in the Dordogne area of southwestern France to unload a full lorry. When the crew arrived they were presented with a new and very steep road layout. Unfortunately, the Google Earth imagery had not been updated since 2012, so we were unaware of this issue, as was the customer. Our crew decided to back the lorry as far down the narrow road as possible leaving little space for cars. Fortunately, it was a quiet village and there was no passing traffic. 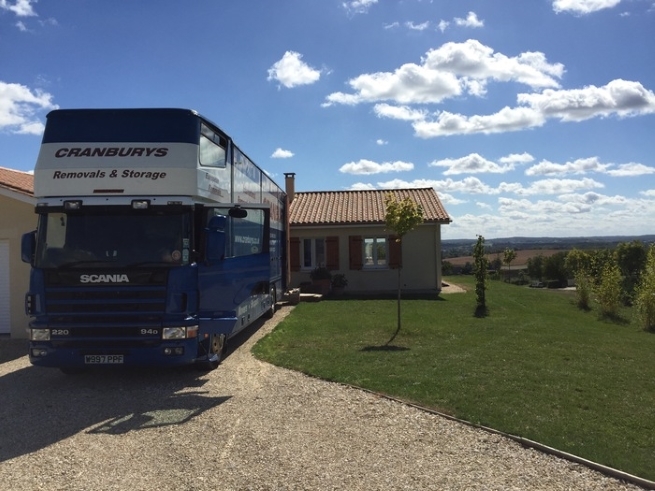 Whilst our crew made a start with the unloading, which consisted of walking furniture at least 30 metres down the hill and into the customer’s new home, we worked away to find them assistance nearby in France. Luckily, we have a few companies that we work closely with in France. One company, owned by an English family living in France, sent out a member of their staff and a van to assist with a tranship. ‘Access at it’s worst’ is how our crew described this. We do as much as possible to check the access in France at customer homes and roads/lanes leading up to, just to minimise the risk of bad access. What do you use to find the delivery address? All our staff are supplied with Sat Navs to find addresses in France. Our office staff will also provide directions/maps in case the Sat Nav cannot pick up on an address, which has happened a fair few times. Any amusing tales from your travels? 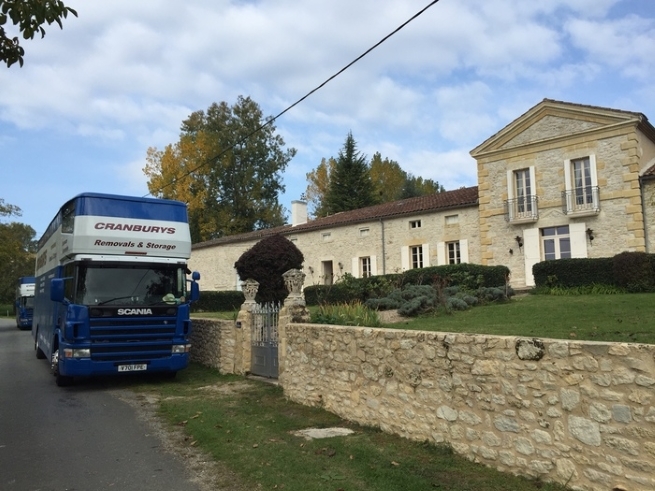 There have been many strange or amusing events during trips through France, from customers and our staff becoming tree-surgeons in order to get the lorry down a driveway to French neighbours becoming removal porters for the day! What are the facilities like on-board? The facilities on board the vehicle are quite basic but they are enough to house the staff for up to a week or two at a time. We provide a portable fridge so that they can keep fresh food, gas stoves for cooking and portable kettles. Inside the cab there are three beds, two upstairs and one behind the driver/passenger seat. The crew have a portable shower, for when they stop in services without these facilities and some even take small TVs and Xbox consoles for a little entertainment in the evenings or on stand down days. With the amount of time the crew spend in the lorries, we think it might be time for a little upgrade. If you were to move to France, where would you head to? A little village called Saint-Saturnin-lès-Apt in the South of France – it’s beautiful. Finally, two things that make a move go as smoothly as possible. The most important factor is ensuring we have gathered/been provided, all of the information regarding the move and what is required, as well as informed the customer and our staff as to how the move will be carried out. It also helps when the customer has prepared their home for the move, having everything packed up ready to go – apart from the tea or coffee of course! Have you delivered to Nice much? We have delivered many customers to Nice, most of which have been carried out using a smaller lorry or hire vehicle to tranship in or out of the customer’s home. Any particular challenges to overcome in the city or our location? The only challenge to overcome was the access, which we knew about before setting off to the delivery address. There was a low bridge heading towards the property and gates, followed by a steep drive with a tight bend. The way we overcame this was to arrange to hire a smaller vehicle at a near by Europcar and tranship for our lorry, onto the hire vehicle and into the new property. Taking into account that there are driving restrictions on HGV’s and a driver can only drive for 4.5 hours before a 45 minutes break and a further 4.5 hours of driving in one day, it can take some time to reach the South of France. Depending on traffic/weather conditions, it can take at least 1.5 – 2 days to travel, there and back. When we have a driver travelling this far, we usually arrange a Sunday evening ferry crossing, which docks in at 6am on a Monday, to give a head start to the week. 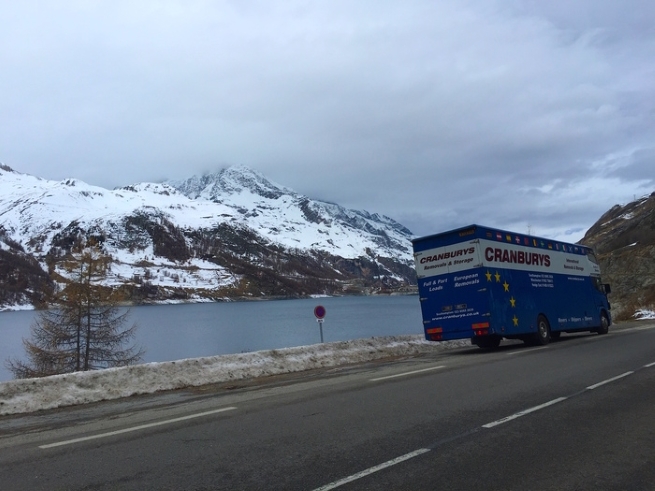 For more information on Cranbury Removals and their services to France, visit their website.